Store – Item Profile title - Fitness Etc. The World’s 1st Pharmaceutical Grade Anabolic Activating Experience! Branched Chain Amino Acids (BCAAs) are known as the building blocks of muscle. They must be present for muscle development and growth. The essential BCAAs are leucine, isoleucine and valine. These BCAAs are classified as “essential” because the human body does not produce them – they must be taken through supplementation. *Take 8 capsules of Magnum DNA 15 minutes prior to training for 3 days and if you haven’t noticed a strength increase, Magnum will refund your money! How quickly can I expect results from Magnum DNA? You should start to see noticeable results in your first THREE days; however, we have had many customers & athletes experience a difference in their very first workout on DNA! 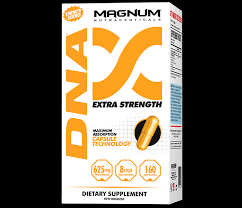 What results can I expect from taking Magnum DNA? Results include noticeable strength gains, endurance, muscle hardening and a big difference in your recovery between sets and between workouts. What is the optimal way to take Magnum DNA? We recommend on the bottle that you take 8 capsules per day – 8 before the workout on training days and 4 capsules, twice daily, on your non-training days. Magnum DNA claims to be very “anabolic,” will I test positive for anything questionable?